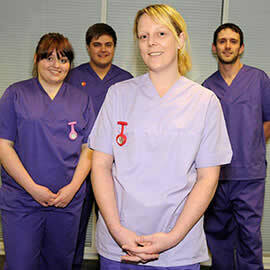 Our staff have a wide range of clinical experience at the forefront of their professional fields. They work in partnership with local health providers, including Betsi Cadwaladr University Health Board and other care providers in North Wales and North West England, to ensure our students’ learning is of the highest quality. We are leading Health and Medically-related research programmes which are transforming the quality and delivery of healthcare in Wales and internationally. Roughly half of your learning on Nursing, Midwifery and Radiography will be in a clinical environment – all placements are in modern well-equipped settings. No other university offers more clinical weeks throughout the course.